We’re writing this newsletter from a campsite in Norway, where it’s easy to say that summer has arrived. Surrounding us are tall trees and steep mountains, and although some of them have snow on their peaks, the sun is hot and bright at the base of the mountain. We’re dressed in shorts and sun hats, and our bare legs and feet are soaking up the warm sun. We’re here for our 2014 Nordic Tour, which started last weekend in Helsingborg, Sweden. 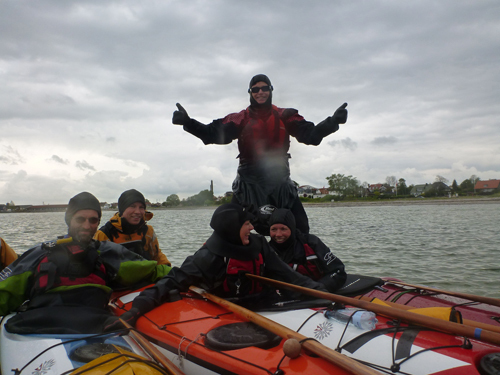 This year’s tour is supported by Rebel Kayaks, and on Saturday morning we met up with Johan Wirsen, who owns the company. Johan is the designer of the Tahe Greenland, which was renamed the Zegul Greenland, but he’s taken his design to his new company and it is now calling it the Rebel Ilaga, which Helen is using during the tour. Mark is using another of Johan’s designs, the Greenland T, a larger version of the Ilaga that is also part of the Rebel line. 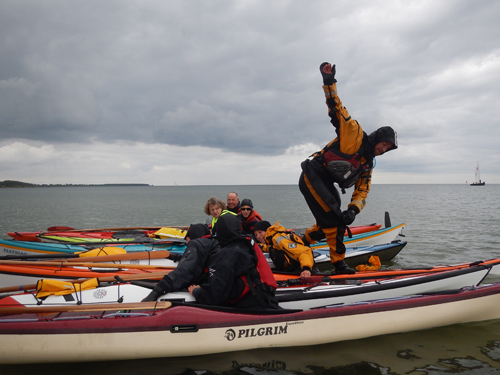 Both kayaks are made in Poland by Aquarius. 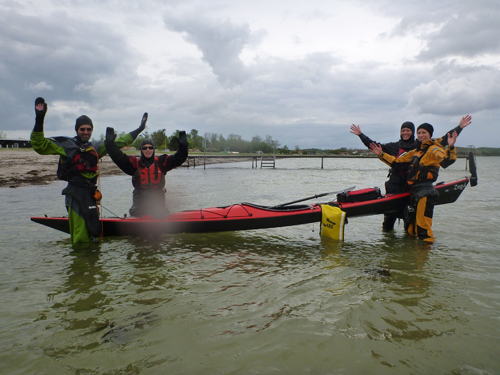 After getting our kayaks we hit the water, running a general sea kayaking class on Saturday and two sessions of Simplifying the Roll on Sunday. We also had the opportunity to explore the active seaside community by both bike and foot before beginning the long drive to Norway on Monday afternoon. We’ve been steadily making our way to Bergen, stopping at campsites along the way and exploring as much as we can. We’re teaching classes in Bergen on Friday, Saturday and Sunday, and we’ll be sticking around and teaching classes in Norway for most of June. 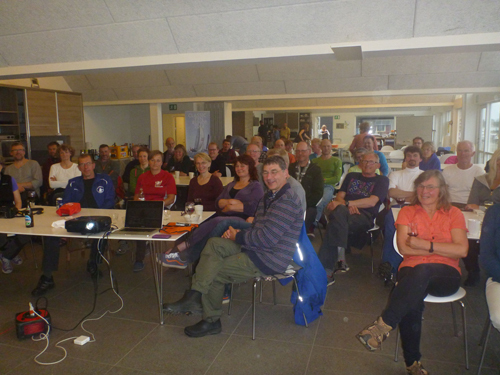 At the end of June we head to Denmark, and in July we have classes in Sweden and an expedition in South Greenland. August takes us back to Sweden and Denmark, and the tour continues through August 31. It’s going to be a busy summer! Later this year we have classes and symposia scheduled in the U.S., Wales, Scotland, Israel and Mexico. More on all of that later. As usual, visit www.greenlandorbust.org for more information and our current Events calendar, Shop and Blog postings. For questions, comments or to schedule us in your neighborhood, email info@greenlandorbust.org. Wherever you are, enjoy the summer, and happy paddling! 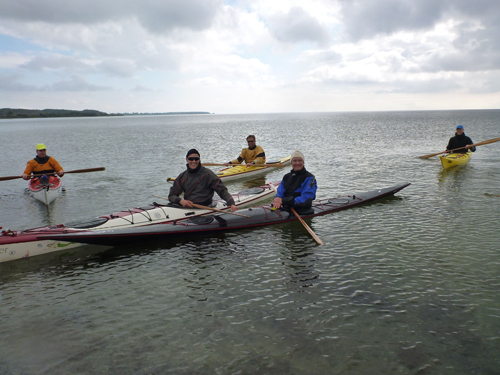 When paddling in areas where we might find moving water, be that from the current or flow from estuaries, we need to think more tactically (choice of angle) and accurately (use of speed) when maneuvering our kayak. It might be that we want to cross the stream without loosing ground, or enter the stream to make progress downstream / exit the stream to find safe water, or even progress upstream to play on a wave / go round a corner. Your target will determine your angle and the speed of flow, as well as your paddling speed will determine how quickly you get there. To help understand our position as it relates to angle, think of upstream being 12 o’clock on a clock face. Now you can experiment when entering and leaving the flow by pointing your kayak at different hours (angles). For example, by aiming the kayak at 1 o’clock you may find that the kayak makes a wider turn and ends up further from the eddy line. If you aim the kayak for 3 o’clock then you may find yourself turning more rapidly and heading down the flow, perhaps closer to the eddy line. What you should discover is the more the kayak points across the flow, the sharper any maneuvers become. Now you can experiment with how fast you are paddling when you enter and leave the current to see how much that effects any maneuvers. From this you should see that the faster you paddle, the wider the turn and the further you travel into the flow or eddy. The slower you go, the sharper the turn. As it takes time to build speed, plan ahead and think about how much room your long boat needs to do this before entering / exiting the flow. Remember, with the right speed and angle you will eventually reach the intended target! Travel is one of those weird things. If everything goes as planned it’s amazing how quickly one can travel to the other side of the world. Sometimes though, there’s a hang up, and the traveler has to get a little creative. That’s exactly what happened last weekend on my way to the Danish Canoe Federation’s Weekend for Coaches, which I arrived at exactly ten minutes before the event started with very little sleep over the past 40 hours of travel time. A dunk in the sea however woke me right up, and it turned out to be a wonderful weekend. 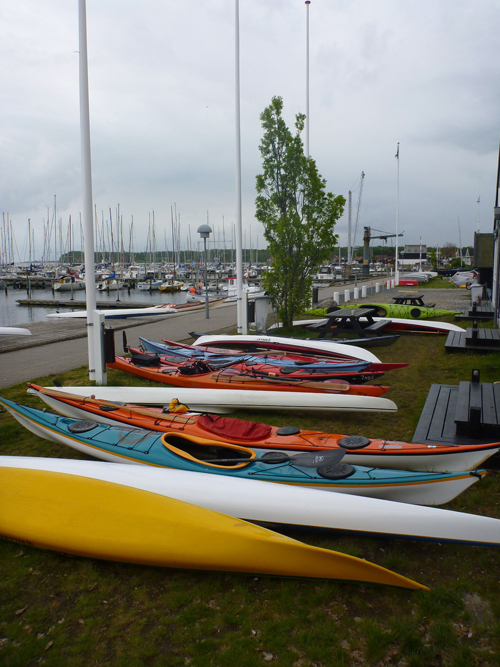 Colorful rows of kayaks are always a good indication that you’re in the right place. 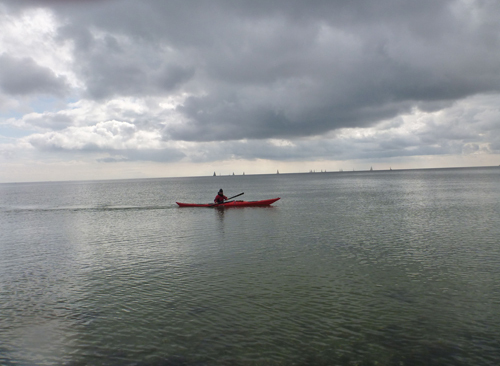 The event took place in Kerteminde, on the island of Funen in Denmark. Participants at this event are all coaches, and they’re working on both personal skill development and developing stronger programs for their students. Fun, Balance and Games is all about creativity and thinking outside the box. There are lots of ways to learn. Of course no class is complete without a little kayak levitation. Lots of people came out for the evening presentation. On Sunday I woke up refreshed and ready to teach Yoga for Paddlers. After that my day was all about rolling. I ran Simplifying the Roll in both the morning and afternoon. All of the participants already had some kind of roll, so we worked on cleaning up technique, other side rolls and everything from Storm Rolls to the Straightjacket Roll. After the event I was taken back to Copenhagen for a night in a hotel before heading back to California. The weekend went by very quickly, but was a TON of fun. Special thanks to Malene Hjorth for taking such good care of me! Photos by myself and Jens Lauritsen of Odense, Denmark. This week has been so hot and sunny in Northern California that it’s easy to feel guilty. The State has been in a draught for months, and more sun is the last thing that we need… but it feels so good to be outside eating strawberries, drinking margaritas and enjoying the gorgeous weather. This weekend Helen heads to Whiskeytown Lake in Northern California to run rolling and rescue classes. 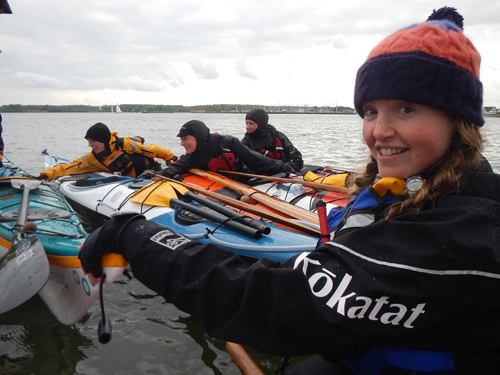 After that she hops on a plane to Denmark to instruct at the Danish Canoe Federation’s weekend for coaches. Mark in the meantime will be at the Anglesey Symposium and teaching during BCU Week. Then it’s home for a week and Mark will be busy preparing the van for this year’s Europe Tour, which will be supported by Rebel Kayaks. This year’s tour will be HUGE! It starts in Helsingborg, Sweden on May 24 and continues until August 31. This year’s tour covers Sweden, Norway and Denmark. We’ll be taking a break from the tour for a couple of weeks in July when we’ll be flying over to Greenland to guide an expedition and stop in at the Greenland National Kayaking Championship, taking place in Qaqortoq, Greenland. We’ve been working hard on organizing the U.S. Storm Gathering symposium, taking place in Trinidad, California on March 6, 7 and 8, 2015. Sponsors are being confirmed, and the local community is prepared to warmly welcome participants and instructors from outside the area. If you came to the ENC Kayaking Social, you’ll know that our local paddlers ROCK and they’re getting excited about an event in their neighborhood. Come join us! Often when teaching rolling, I have students ask me about bringing their foot pegs closer to lock themselves in their kayaks. While this may seem like a good idea, it really isn’t. By bringing the foot pegs closer you are locking in your hips, which will restrict their movement and therefore make rolling more challenging. Your feet should feel relaxed and comfortable on the foot pegs, similar to how they feel when driving a car. Although I wouldn’t suggest removing your foot pegs completely, you’d have better control of your roll with no foot pegs, than having them too close.